For the last 17 years I have considered travelling along the Parramatta Road, Sydney, Australia, a necessary evil. It’s meandering course separates suburbs with a steady stream of traffic from the edge of the City to Parramatta in the west. Since crossing this busy arterial road to live in Leichhardt, I have come to appreciate the novelty of the highway closest to home. Car, furniture and bathroom showrooms intermingle with bridal shops and brothels. I’m pleased to be wrong in my assumption that I would not come across an art installation in this microcosm of retail delight. Located on the side of Kennards, former British Breweries Building, Taverner’s Hill, Petersham, is a mural sculpture by Paul Beadle. A finalist in the Sir John Sulman Prize, 1953, the frieze of four figures: “Farmer, Brewer, Drayman, Publican,” stand 12 feet 6 inches (3.81 metres) high. 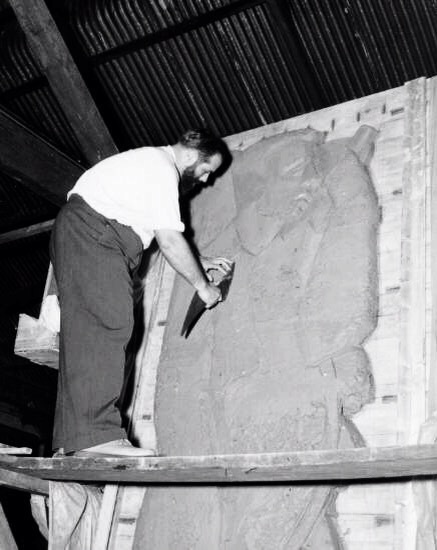 This photograph entitled “Paul Beadle, Sculptor“, shows the Farmer being created, Newcastle Morning Herald, 1953 (i). An article in issue 38, Cockle Creek News, May 1954, entitled “Interesting Use For Sulphide Cement” (ii), notes the use of half a ton of Celerite cement at a ratio of 3:1 sand to cement, along with the vivid description of the manufacturing process includes ramming the mix into plaster of Paris moulds. Mr Beadle is also responsible for sculpting the stylised American eagle in aluminium on a bronze ball that adorns the Australian-American memorial in Canberra, Australia, designed by Richard Minchin Ure (iii). Paul Beadle (1917-1992), sculptor, was born in England and studied at the Cambridge Art School and the Central School of Arts and Crafts during the 1930s. He arrived in Australia in 1944 and became known for his ‘bronzetti’ satirising history, literature and politics. He taught at the NAS for four years before becoming head of the Newcastle Art School in 1952; later he was principal of the South Australian School of Art for two years. 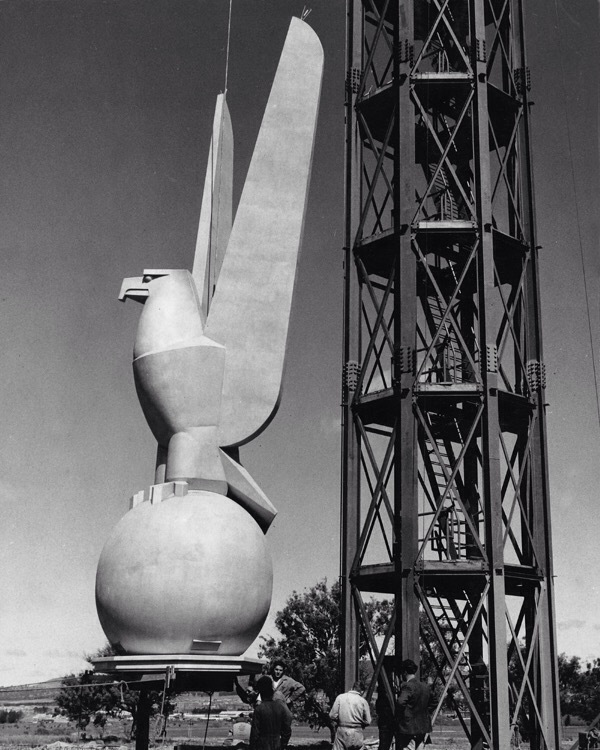 Beadle made the 11-metre high eagle and sphere surmounting the Australian-American Memorial at Canberra’s Russell Offices, which was completed at a cost of 100 000 pounds (much of it raised by public subscription) in early 1954. In 1961 he moved to Auckland to take up the position of Chair of Fine Arts at the University’s Elam school. In 1969 he exhibited at the Bonython Galleries in Sydney as well as in Adelaide and Auckland; up to the mid-seventies he showed at Australian Galleries in Melbourne. I particularly like the “sculptured” style of this portrait of Paul Beadle. 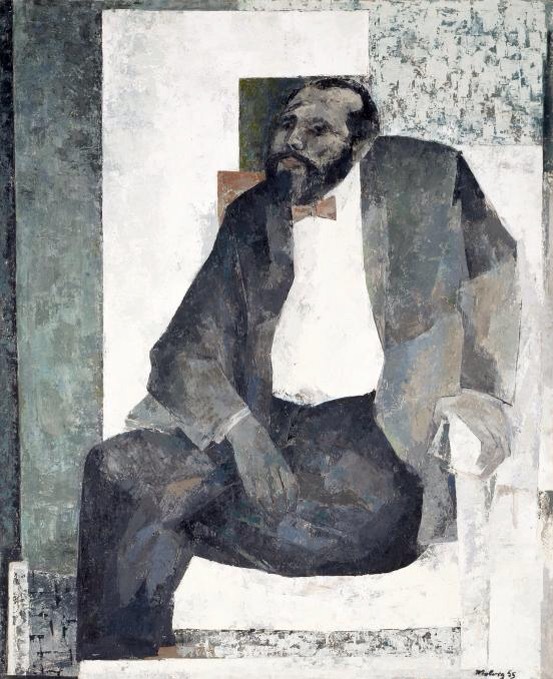 Paul Beadle, 1955 by Jon MOLVIG (iv), oil on (composition board), 152.0 x 122.2 cm. Thanks from me as well, beautiful pieces. That eagle is amazing. I note he has a beard. I like the portrait as well.